Well now I guess all can be revealed regarding my involvement in the special bonus features on the Blu-ray release. Yes, it’s true – it will be my voice you will be hearing on the commentary track – as I talk at length about the troubled history of the making of the movie and impart the odd piece of fascinating trivia here and there. I would like to give a big thank you to Cliff MacMillan at Shout Factory for allowing me this terrific opportunity and also a big thanks to special features producer Reed Kaplan for chasing up some of my suggestions for people to approach. I would also like to thank my illustrious co-host on the commentary track, my good friend Dave Bradley and also engineer Kat McCarthy for driving the desk during the recording – thanks Kat! I look forward to checking out what I am sure will be a release which will be enthusiastically embraced by fans around the world – as well as sparking interest from new fans who have yet to see this fun little movie. Cheers everyone! – And thanks again! Both awesome and excellent news! Especially about the deleted scene and additional tv scenes! I’m even more curious about what Colin Chilvers and Roy Doctrice have to say about their participations in the ITC film. Greg, I look forward to hearing the commentary that you and David recorded for the blu-ray. Minus two months and counting…. Cheers Chris! Yeah, I’m also really looking forward to hearing what Roy Dotrice has to say – hopefully he’s gonna shed some much-needed light on the reason behind his revoicing of Harvey Keitel’s entire performance … something which has been a complete mystery to us all for the past thirty-three years. I’m also keen to hear what Colin Chilvers has to say about the difficulties he and his crew encountered in getting Hector to perform. Not long now! 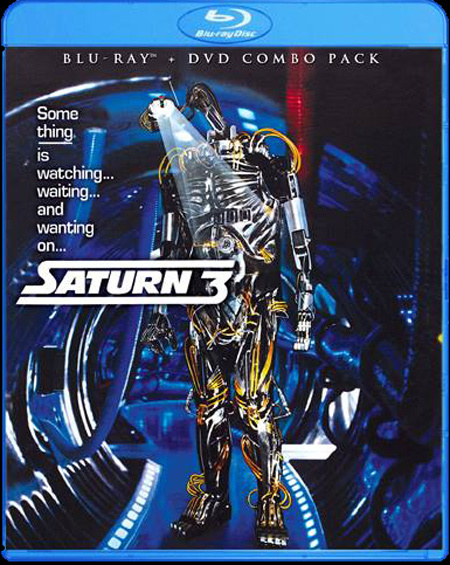 i just purchased saturn 3 on blu-ray, havent seenit since 1980. i know the production had issues..but this movie brings back memories of my 14thyr on the planet earth..(LOL). anyway. i enjoyed sat-3, for what it tried and tries to set. i loved the famous monsters of filmland issue with kirk douglas on the cover. ( still in my collection)…its about memories of the early 80’s when space movies were jumping out left and right. before mtv , before i grew into adulthood and the magic of movies died. thanks to cgi, bad actors. anyway saturn -3 is like the friends down the street..nobody wants to deal with them.but they do things no one else tried. childhood memories..cant be erased..as saturn 3’s problems…i say sit back and enjoy. hey there is a website for the movie so their are still fans out there. That Famous Monsters Of Filmland issue you have wouldn’t happen to be the same issue which contains Ric Meyer’s final interview with John Barry, would it? is there any books or fan made magazines of the movie? is there any blu prints of the robot..or any sets? thanks so much for any help. Hey Larry! The only book which was published to help promote the movie was the novelization by Steve Gallagher – which was published by Sphere Books back in 1980. It’s long been out of print, but I’m sure you could find a second hand copy on e-bay. As for blue prints – as far as I’m aware, there were never any blue prints released commercially. Hope this helps. Has anyone ever heard the Harvey Keitel voiced version? Do you think it exists anywhere? Has Keitel ever commented on it?